The award-winning Harley Gallery has a national reputation for excellence and innovation. Situated on the Ducal estate of Welbeck in NorthNottinghamshire, this free entry venue offers a unique mix of striking architecture, exhibitions, craft shop and museum. The diverse programme of events includes displays of contemporary craft,visual art, photography and design; Christmas Art Market, Lectures and workshops, aiming to appeal to all audiences from family groups to those with specialist interests. The Portland Collection of fine and decorative arts on show in the Harley Museum and work for sale by leading British crafts people in the Harley Craft Shop. The Gallery is supported by the Harley Foundation, a charitable trust set up in 1977 by the late Ivy, Duchess of Portland. 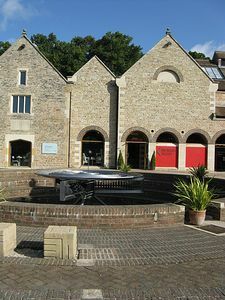 The Foundation also provides studio space for 25 artists at Welbeck, which open to the public annually in November. On the Welbeck Estate, entrance located on the A60 Mansfield Road, approx. 30 mins. From Nottingham, Sheffield, Lincoln and 15 mins. From Ollerton.